More than a dozen University of Central Florida students played at being NASA engineers recently, launching a high-altitude balloon the size of a refrigerator into space. The students, studying a variety of fields from physics to accounting, designed the mission, made all necessary calculations and executed the launch from a public park in Safety Harbor. The goal? 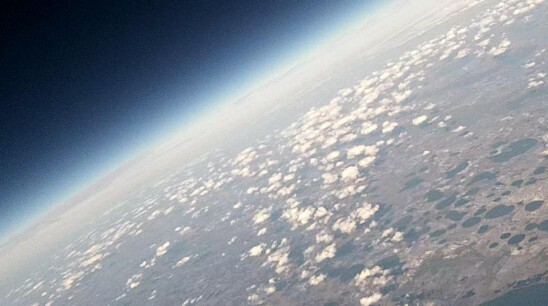 To see if they could send the balloon into the stratosphere with a high-definition camera , which would capture images of the curvature of the planet. The balloon then had to pop, deploy a parachute and deliver the camera safely back to Earth to be recovered. Mission accomplished. The balloon climbed well beyond the start of the stratosphere and ruptured at more than 85,000 feet as planned. The students recovered the camera safe and sound in Southeast Osceola County. A YouTube video showcases the amazing views the camera captured during its two-hour odyssey. Gabriel, who is pursuing a degree in physics with an emphasis in astronomy, found his love for space science by following NASA and European Space Agency space missions and attending events at an observatory in Broward County. The club regularly hosts observation nights at UCF’s Robinson Observatory and takes telescopes out to local festivals and schools to help make space more real for the general public. The group meets every other week on campus to talk about the latest news in astronomy, play space trivia games, listen to lectures from guests and watch movies. “I like our outreach work because it gives me an opportunity to inspire others to study the cosmos, and it also lets me make others aware that they don’t need to be physics majors to get involved with astronomy,” said Jason Wojkiewicz, the society’s treasurer and a finance major at UCF. For more information on the club and its activities go to http://planets.ucf.edu/astroclub.